Despite its name, there is nothing to fear from this low-growing shrub, although its healing properties may seem a little like witchcraft. Actually, witch hazel may have gotten its name from its association with dowsing, which was once thought to be a form of witchcraft. Witch hazel’s branches were once the wood of choice for dowsing rods, whose purpose was to locate water, or “witch” a well. 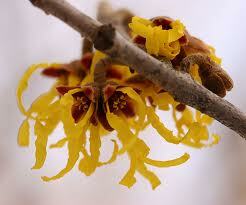 Although witch hazel was once used to find hydration, it is now used as an herbal remedy to dry and cleanse skin. The bark, leaves, and twigs of witch hazel are all high in tannins, giving this plant astringent properties. It is also used as a soothing, anti-inflammatory. Drugstore witch hazel is combined with isopropyl (rubbing) alcohol for use on external skin conditions, this form of witch hazel should not be used internally. Although Witch Hazel had been used by native peoples for nearly two centuries, it was not until Thomas Dickinson built a witch hazel distillery in 1866 that the tree became commonly known for its medicinal value. Dickinson’s formula remains one of the oldest medicinal preparations to have survived unchanged, eighty-six percent double-distilled witch hazel extract and fourteen percent alcohol. Witch hazel has been used in hair tonics and aftershaves. It prevents wounds from becoming infected, works as an astringent to constrict tissues and stop bleeding, and soothes windburns and sunburns. It also chases away mosquitoes, relieves swelling and aching muscles, and works specifically to treat diarrhea, and varicose veins. You can rinse your mouth with witch hazel and myrrh for cases of swollen and infected gums. Again, use fresh tea or tincture, not the drugstore witch hazel, which contains isopropyl alcohol. Place a dropper full of tincture of each herb in 1/4 cup of water and use as a mouth rinse. A teaspoon of strong witch hazel tea combined with one drop each of myrrh and clove oil makes a pain- and inflammation-relieving gum rub. Acne – use as an astringent to remove dirt and oil without drying skin. A cotton pad soaked in witch hazel can treat blemishes. Blisters – dry blisters by applying a gauze pad soaked in witch hazel, then covering with a bandage. Insect Bites – relieve itching and swelling by applying a cotton pad soaked with witch hazel to the bite. Minor Cuts – a natural antibacterial, witch hazel can be applied directly to the wound. Deodorant – pour witch hazel on a cotton pad and dab under arms, allow to dry. Sunburns – gently apply a washcloth soaked in witch hazel to provide relief and prevent skin from flaking. Toner – the astringent properties of witch hazel tone skin and tighten pores. To make a toner, combine equal parts distilled water and witch hazel. Essential oils can be added for a more personalized toner.